According to the Census Bureau, the population of the United States will exceed 416 million by 2060, up from 309 million in 2010, the year of the last full census. Coincidentally, the increase is nearly the same as the entire U.S. population in 1910, 92 million. All those millions of people will need places to live and food to eat, naturally, and the question becomes where and how — and what the environmental consequences of our choices will be. Research has shown that humans are having a growing impact on the planet’s ecosystem, taking a larger share of the biosphere’s production. Research from Yale, Texas A&M and Boston University published in 2012 found that worldwide, nearly 6 million square kilometers of land could be urbanized by 2030. And as low-density sprawl pushes outward in both the developed and developing world, so too do cultivated lands: A 2012 study in Proceedings of the National Academy of Sciences found that we will have to nearly double the land under cultivation to feed the world’s projected population of more than 9 billion people in 2050. However, there is not an infinite supply of land to convert to farms, suburbs, malls and highways. Moreover, with every acre that’s covered in asphalt or plowed under, biodiversity suffers, and that’s not something we can do without: A 2012 metastudy published in the journal Nature reviewed more than 20 years of research on biodiversity and found “unequivocal evidence” that its loss reduces the efficiency with which ecosystems capture resources, produce biomass and decompose and recycle biologically essential nutrients — ones that, in turn, feed humanity. A 2014 study in Proceedings of the National Academy of Sciences, “Projected Land-use Change Impacts on Ecosystem Services in the United States,” looks at how the next 35 years could play out. Using an econometric model, the authors project land-use change in the contiguous United States from 2001 to 2051 under five scenarios: (1) Continuation of land-use trends experienced from 1992 to 1997, called the “1990s trend.” (2) High commodity prices that create pressures to convert more land to agricultural use, similar to the period from 2007 to 2012; this is referred to as the “high crop demand” model. (3) $100-per-acre incentives to increase forestation and reduce deforestation. (4) $100-per-acre incentives to conserve natural habitats, including forests, grasslands and shrub lands. (5) Restrictions on the expansion of urban and suburban sprawl, with the goal of concentrating growth in existing metropolitan areas. Changes were calculated only for privately owned land; public lands were assumed to remain unchanged. The two baseline scenarios — the 1990s trend and high crop demand — both resulted in rapid expansion of urbanized areas and loss of rangelands and pasture. Loss of cropland under the 1990s trend was 11.2 million hectares (27.7 million acres); under the high crop demand scenario losses rose to 28.2 million hectares (69.7 million acres). Forest land increased modestly under both scenarios, but with patterns of gains and losses. Urban land is projected to increase by 26.2 million hectares (64.7 million acres) under the 1990s trend and 29.5 million hectares (72.9 million acres) with high crop demand. These represent, respectively, a 63% and 71% increase from 2001 to 2051. Food production increased significantly under both scenarios, with the number of kilocalories produced rising 50% under the 1990s trend and doubling with high crop demand. “Increases in food production are driven by increases in crop yield (which we assume will increase by 6% every five years) and changes in agriculture area.” The researchers cautioned that the gains could be overoptimistic if the growth in yields is linear rather than exponential. The $100-per-acre forest incentive resulted in the addition of 30.6 million hectares (75.6 million acres) of forest land, a rise of 14% over the baseline. The increase was primarily the result of rangeland, cropland and pasture being converted to forest. Biomass grew significantly with forest incentives, increasing 8% relative to baseline, while timber production rose 18%. Food production decreased by 10% compared with the 1990s trend baseline scenario. The $100-per-acre habitat conservation incentive increased rangeland by 12.4 million hectares (30.6 million acres), a rise of 5% relative to the baseline. Most of the increase comes at the expense of crops and pasture, with little change in forests. Carbon storage, timber production and food production all dropped slightly. Urban containment was the only policy that significantly influenced how metropolitan areas grew. It held urban growth to 12.2 million hectares (30.1 million acres), compared to a baseline increase of 29.5 million hectares (72.9 million acres) under the high crop demand scenario — 59% less. Urban containment also resulted in slight increases in forest, rangeland and pastures. 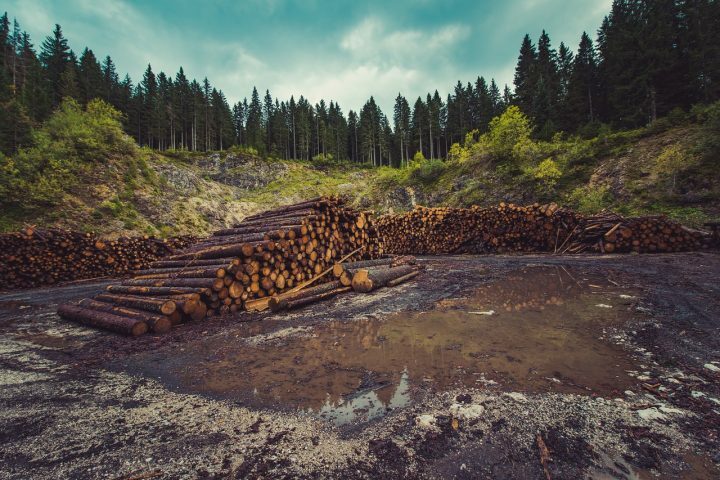 The costs of the incentives for forests and habitat varied significantly: The forest incentive required approximately $7.5 billion in annual government subsidies to landowners, a consequence of the ease with which agricultural land can be converted to forest. In contrast, the natural habitats incentive policy generated a positive cash flow for the government of approximately $1.8 billion annually. Related research: A 2013 study in Proceedings of the National Academy of Sciences (PNAS), “Global Human Appropriation of Net Primary Production Doubled in the 20th Century,” analyzes humankind’s growing impact on the biosphere, from our consumption of food, organic materials and other products of sun-powered energy, to our effect on the composition of the atmosphere, biodiversity and food webs. It found that from 1910 to 2005, human population grew nearly fourfold — from 1.7 billion to 6.5 billion people — while economic output increased 17-fold. Over the same time, human appropriation of net primary biosphere production doubled. While proportionally lower growth in biosphere appropriation is a positive, it still increased from 13% in 1910 to 25% in 2005, meaning that humans currently appropriate a full quarter of the net primary productivity of the biosphere. Citation: Lawler, Joshua J.; Lewis, David J.; Nelson, Erik; Plantinga, Andrew J.; Polasky, Stephen; Withey, John C.; Helmers, David P.; Martinuzzi, Sebastián; Pennington, Derric; Radeloff, Volker C. “Projected Land-use Change Impacts on Ecosystem Services in the United States,” Proceedings of the National Academy of Sciences, May 2014, Vol. 111, No. 20, 7492-7497. doi: 10.1073/pnas.1405557111.